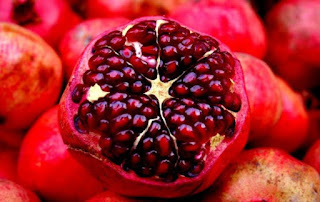 Pomegranate is a fruit which contains lots of edible seeds known as arils. They are categorised as berry, and they have antioxidant, anti-tumor and antiviral properties. These qualities makes it to be a healthy fruit that should be consumed regularly. Pomegranate is also a good source of vitamins, especially vitamin A, C, and E, as well as folic acid. Pomegranate is an amazing fruit, because it contains three times as much antioxidants as both wine and green tea. Without further discussion, below are 5 reasons you should be eating this delicious fruit so as to enjoy its important health benefits. The peel, bark and leaves of pomegranate are used in treating stomach disorders and diarrhoea. Drinking tea made from the leaves of pomegranate is used in curing digestive problems, and pomegranate juice is also used in treating diseases like dysentery and cholera. Pomegranate contains high levels of antioxidants, and flavonoids which makes it effective in fighting against various cancer radicals, particularly breast and prostate cancers. The fruit has the ability of reducing the prostate-specific antigen (PSA) levels in the body, and helps in the fight against existing cancer cells in the body. One of the top notch health benefits of pomegranate is that its juice, together with its antibacterial and antiviral properties helps to reduce the effect of dental plaque and protects against various dental diseases. Pomegranate supplies iron to the blood, this helps in reducing the symptoms of anemia which includes; fatigue, dizziness, weakness, and hearing loss. If you are suffering from diabetes, drinking pomegranate juice can reduce your risk of various heart diseases. Apart from this, you will also experience a reduction in the hardening of your arteries, which can inhibit the development of various heart diseases. Pomegranate's main fatty acid known as Punicic acid, helps by providing protection against several steps in the heart disease process. These are some of the important health benefits you will derive from eating the delicious pomegranate fruits. You might not be aware of some of them before now, but now you do, you can go ahead and always include this fruit in your meal. Kindly use the share button below to get this message across to your friends on Facebook and other social media networks.